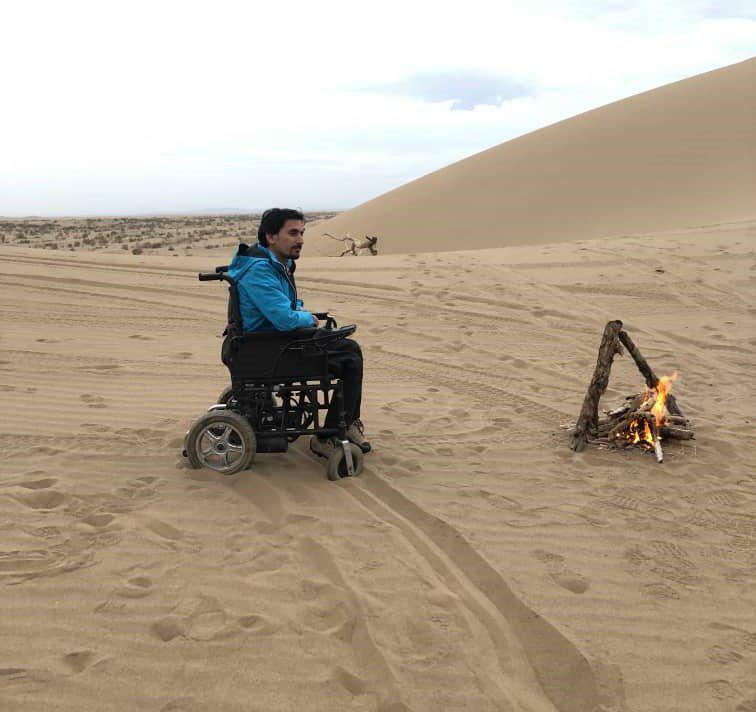 Alireza Mazlumian, a desert adventurer for about ten years, has already made many people interested in the area. He has now decided to share the joy of desert tours with the disabled who have trouble even in their daily trips in the city streets. Mazlumian has learned tour guiding and planning skills from Saeed Zaroori who views life as an adventure. Despite suffering from dystrophy disability, Saeed has the record of kite riding, diving, free fall, cave trekking and desert trekking. Interestingly enough, he served as the leader of the new tour. Below, you can find excerpts of Shahrvand newspaper’s interview with Alireza and Saeed. Q: Why have you chosen desert adventure? Alireza: I was born in 1971 in Damghan and spent my childhood in the city. During those days, desert occupied a big part of my life and I gradually developed an interest in it. That’s why off-road driving in desert has been part of my daily life. Q: How was your recent desert tour in Rig-e Jenn? Saeed: Before the recent tour, Alireza and I made a trip to Damghan desert. During the visit, I decided to organize a tour for a group of the disabled. I raised the idea and put forth my plans. And, now I’m serving as the tour leader. Alireza: I’ve already visited most deserts in Iran. This time, I decided to do a different thing. That’s why I accompanied a group of people who always dreamt of such trips but their dream had never come true due to lack of logistic support. Through one of my friends, I found the disabled and informed them of our decision, saying that we are going to have a desert tour in Rig-e Jenn desert. Some of them welcomed our decision and finally we experienced three to four enjoyable days in the desert. I’m not a tour leader. My desert adventure tours stem from my interest in the desert. We are the first people organizing such a tour. I was resolved to accomplish the project. Another reason motivating us further to accomplish the mission was that the disabled are usually pushed towards social isolation and solitude due to their special situation. This was not acceptable for us. And finally, another reason behind our decision was that given their special conditions, the disabled have to spend two to three times more money to have such trips. And as you know, most of the disabled can’t afford it. So, we decided to fulfill this far-fetched dream for them. The disabled never thought they could experience such a great deal of excitement within this short span of time. They were highly excited and absorbed in the nature. They forgot their problems for some days. They never thought they could experience such moments in their lifetime. We have become good friends after the tour. Saeed: Such trips are usually filled with excitement. Despite the difficulties we had during planning, our trip was highly enjoyable and we provided our friends with some good moments in the nature. Q: Doubtlessly, traveling with the disabled requires special facilities. How did you come up with the issue? Alireza: We had thought it through and provided all the required things. To this end, we also made some research to find out what the disabled may need during such trips. We needed some special facilities. We had to carry their wheelchairs, walkers, special WC and the like. 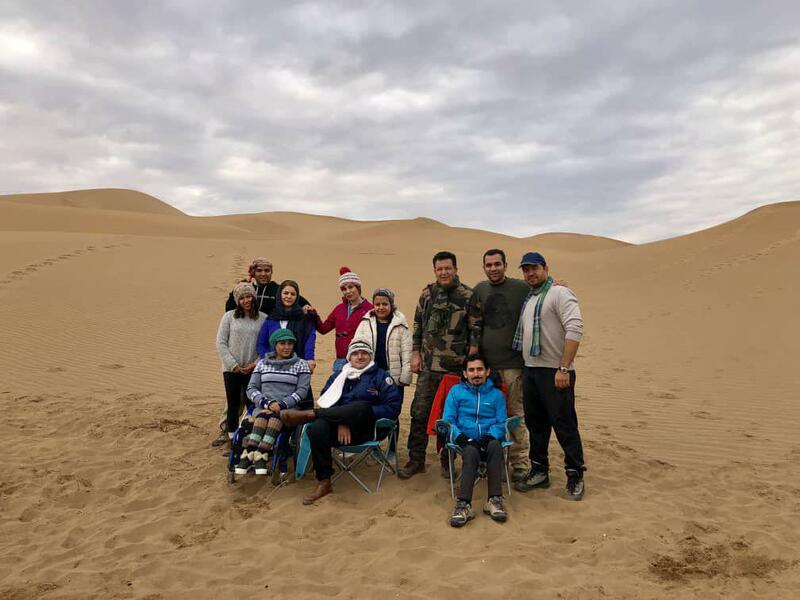 We also ranked them based on the degree of their disability and paid special attentions so that they would not sustain any injury during the trip. Q: One of your future plans is to let the disabled jump from the height. Can they attend the tour? Alireza: One hundred percent, they can. God willing, we are going to organize the tour on Qeshm Island soon. Those interested can experience jumping from a height of 14 to 15 thousand feet during the tour and land with a parachute. 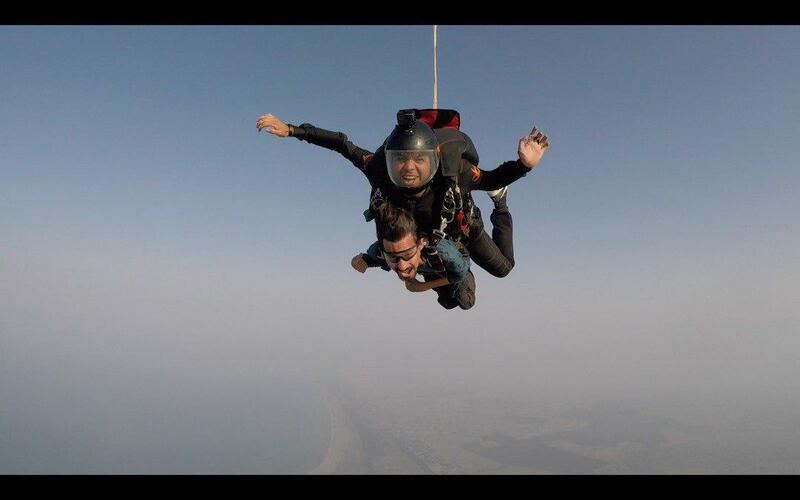 We had the same experiences with Saeed and he managed to jump from such a height in Dubai. It goes without saying that we should have some extra points in mind during such trips given the degree of the disability they have, their weight and the speed of the wind during jumping. I should point it out that the jumping for the disabled should be carried out in two-member groups.